Yoga myths - who hasn't heard about them? Although many things have changed and many climbers are open for yoga nowadays, some yoga myths still exist. Here I share the yoga myths I had in my mind before getting started with yoga and how I see them today. "Yoga. That’s the woman who sits there with her eyes closed doing nothing. Yoga is a world that doesn’t fit into my world." Did you also think (or do you currently think) that about yoga? I used to, besides other yoga myths I had in my mind! That’s why I was all the more surprised/shocked when I attended my very first yoga course in 2005. In 2005, I started with yoga because I wanted to find something that would offer a counterbalance to sitting. Typical cost-benefit thinking. I didn’t think much of yoga back then. A (too) gentle wellness activity. The aforementioned meditating women. Everyone is happy and smiling. Nevertheless, my good friend Yvi and I signed up for a Kundalini yoga course at the community education center. At the time, I wasn’t exactly sure what Kundalini was. But I didn’t care because it was the course that fit best with my schedule. There were two things I hadn’t expected at all. # 1: That the course participants (most of whom were all in white) would actually sing with the teacher at the beginning and end. How did they all (except Yvi and me) know the lyrics?? # 2: That it would be incredibly exhausting! Just relaxing? Yeah, right! So much for my first yoga experience. Or, to put it more diplomatically: preconceptions. We all have them. Sometimes they’re right. Sometimes not. My preconceptions about yoga were far from right – that is, they were only focused on a small aspect of the overall picture. When we started ClimbingFlex back in 2012, then under the name Con Todo, we almost quit after a few months. The attitude among many (what felt like all) climbers was so skeptical that we thought it was just too much of an uphill battle. Luckily, things have changed a lot since then. But some preconceptions still persist and have reached a myth-like status among many climbers. Some of these make me smile because they remind me of my former self. What about you? "I have to be flexible to do yoga." "Yoga is for women, hippies, and softies – not for tough guys like me." "I’m already busy enough. I don’t have time to do yoga." Let me share my thoughts about these yoga myths, reasonable points I see in them and provide a different point of view, too. Myth #1: "I have to be flexible to do yoga." No wonder when Instagram and yoga magazines show people performing extreme contortions with strong circus vibes. Sure, maybe an extreme contortion like that happens to be fun for the person and makes them feel fully alive. But to me, the whole thing usually looks a bit too staged. And it tends to give the impression "So that's yoga ... I'll never reach that point. So why should I even give it a try? It’ll just be embarrassing. And it probably won’t be any fun, either." I can completely understand that thought. On many routes, increased flexibility gives you more range and options. You also have more stability and focus because you no longer have to waste your valuable energy working around flexibility problems. Climbing in the impressive Valle de Los Condores, Chile. When my response to the flexibility myth is "That’s the best reason to start," what follows is either an embarrassed grin or, as recently with a climber, an awkward silence. But it’s true. As a kid, you don’t go to school and say, "I should already be able to read, write and do the math." And even if you think that you’re the most stiff-jointed climber in the world ... there are always poses and exercises that can help you make progress. You don’t have to jump right in with the most difficult flexibility exercise. Start with something manageable. Myth #2: "Okay ... but yoga is mystical." At the time, Carlos regarded yoga as quite suspicious because the whole meditation thing and so on made it "too mystical." But together with our friend Andresito, he ended up having a lot of fun taking an Ashtanga course and became a fan. Personally, I also prefer to master the basics first rather than focusing on the path to happiness while completely missing the mark when it comes to "worldly" and interpersonal matters. Needless to say, there’s a considerable difference between pure stretching and yoga. to sing OM or mantras, as is primarily the case in traditional yoga classes? to have candles or incense in the room? to close your eyes and concentrate on your breathing? (because it’s not the norm) to not feel stressed for once, but truly relaxed? Sitting (or lying down) and letting your revolving thoughts rest for a moment. Taking in your surroundings. Is that mystical? Not to me. It is to some people because it’s become normal for them to be busy and live in the Before/After, but not in the Now. My goal: making yoga livable rather than abstract. Each style of yoga is a little different. And every instructor teaches his or her classes differently. Alexander from Vienna, who has been doing online yoga with us since the very beginning, told us something on the RocTrip that really resonated with me. 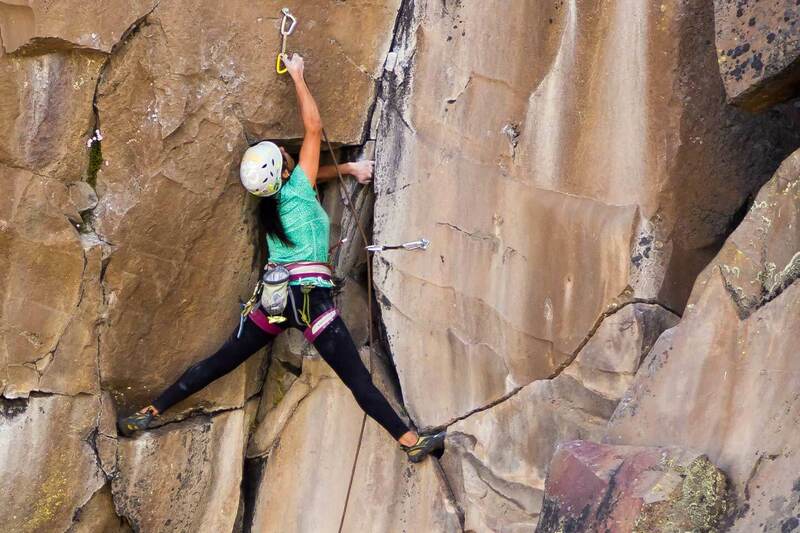 "I think that you make yoga truly livable for me as a climber. For everyday life, not for the monastery." That made me really happy because I realized that that’s precisely my goal. I don’t want to turn yoga into something abstract and play the guru. Not to say anything against the ancient scriptures and all the wonderful knowledge about yoga. But I want to reach climbers where they happen to be – whether that’s online, in a workshop or at yoga class. I want to give them something that works for them. Challenge them so they can experience personal growth. And help them feel strong, energized and balanced instead of just "pretty good." Of course, yoga can be mystical. But it doesn’t have to be. Sometimes you’ll encounter things that irritate you and that you may never get used to because you simply don’t like them. Try several styles and instructors until you find what works for you. 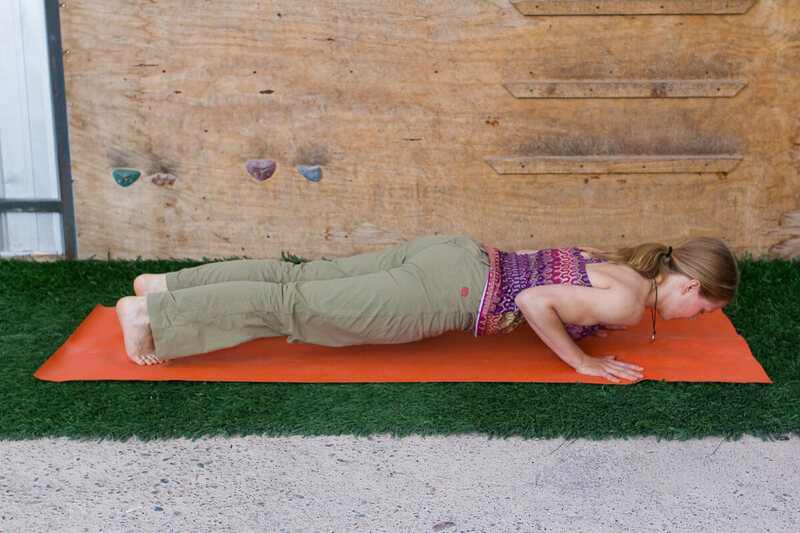 Myth #3: "Yoga is for women, hippies, and softies – not for tough guys like me." I didn’t think of myself as a tough woman. 😀 But this was definitely one of the prejudices I had! I didn’t identify with the group that I thought was doing yoga. But hey, I’m glad that I left that kind of compartmentalized thinking about yoga behind and decided to just go ahead and register for the course! Even if the course experience initially reinforced my compartmentalized thinking about the kinds of people who do yoga, I realized that it was challenging and brought me closer to having more strength, energy, and concentration. Phew, exhausting!! If you’re not really seeking to gain relaxation or concentration from yoga, you’ll find plenty of opportunities to increase your strength, body tension, and endurance. This is also an important part of yoga for me because exercises that strengthen the body strengthen the mind, as well. In the end, the others don’t matter. This is about one person only. About you. Don’t make your activities and your potential progress dependent on others. After all, you don’t stop climbing or bouldering because you find the people or the atmosphere in your climbing or bouldering gym unpleasant, right? There are always other options. One more thing regarding softies – because I do think there’s a grain of truth to that. Does yoga make you more sensitive? I believe so. Or as Stefan, one of my yoga students, puts it: more in tune. when you’re not feeling well physically or mentally. when it’s time to set a boundary. when it’s better to stop climbing. I that a bad thing? Sometimes, this may be a bit "uncomfortable" because, for example, your inner self tells you: "You're not happy in this gilded cage. Quit your job and finally start that project you've always dreamed of." Or: "You say yes too often. It’s time to set a boundary and say no." What seems uncomfortable at first almost always opens a door that leads to better health and more self-respect, energy, and joy. Because who wants to live a bland zombie life that’s "pretty okay" but nothing more? Myth #4: "I’m already busy enough. I don’t have time to do yoga." I’m familiar with the time problem all too well myself. I often wonder how on earth I’ll get everything done. But here’s a little secret: Yoga doesn’t "take up" time. It gives you time. Little things that were on your mind before feel as if they’ve been blown away. Your muscles feel less tense and more relaxed. The Valle de los Condores is located at an altitude of about 2,000 meters, and I consider it a place with a very special atmosphere. After climbing, I felt like doing a few yoga poses. Not as a counterbalance to climbing as usual, but challenging poses in which time briefly stands still for me. You don’t have to attend a course several times a week to do yoga. Doing it at home works fine, too – or you can try the combination course + at home. And you can feel the effects even if you go on the mat for 10, 20 or 30 minutes instead of 90 minutes. It all depends on the poses and the quality of your breathing. I do think that there’s a grain of truth to these four yoga myths, but that it doesn’t reflect the whole picture. For me, these yoga myths are like blinders. They hide all the wonderful things that happen when we get active on our mats. As with many other things, yoga can’t be reduced to black and white but contains many shades of gray. There are so many ways to build your own yoga practice that gives you exactly what you need most. It’s just a matter of making a conscious decision and then following through. What do you think about these yoga myths? 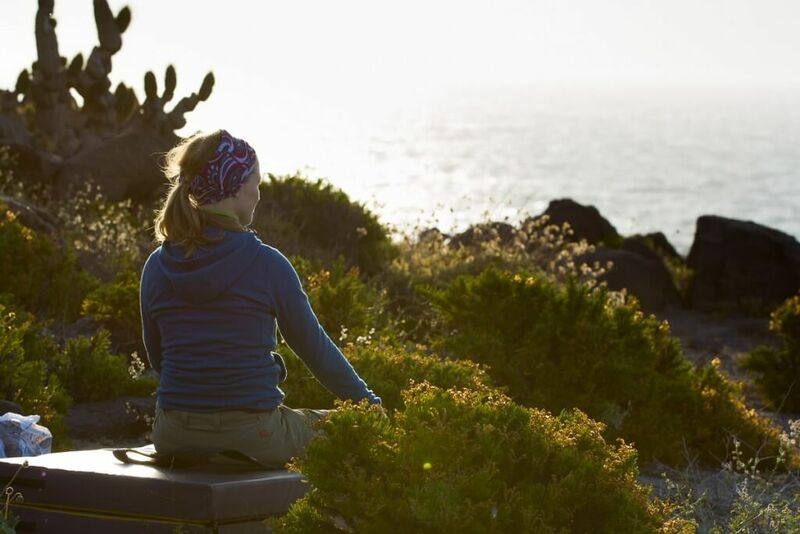 Do you see your previous or current view of yoga reflected in them?